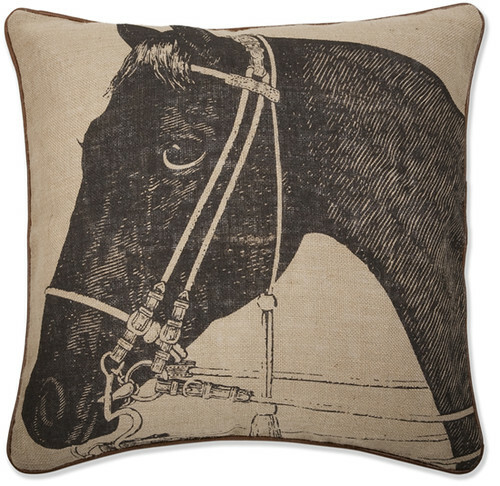 Thomas Paul Pillow Giveaway: Name This Horsey! That's right, my thoroughbred friends -- we've got an equestrian themed GIVEAWAY in honor of Karly's sold out edition of Horsey prints! This one comes courtesy of the fine folks at CSN Stores, who sell everything from bathroom vanities to Knoll and Kartell housewares through their mammoth collection of 200+ stores. I'm sure you can imagine that sifting through 489,654 items before selecting La Horsey was quite the sweaty herculean task, but it's ok. Don't worry about me. Everything I do, I do it for you. Now that I've drummed up an appropriate amount of sympathy and lodged a ridiculous Bryan Adams tune in your collective head, let's move on to the good stuff! Just look at those sweet baleful eyes... who wouldn't want to give this little guy (or gal) a good home? Measuring a substantial 22 x 22 inches square, our equine friend is hand screened with java colored ink onto jute, finished with leather piping, and stuffed silly -- because no one wants a skinny pony. Our lucky winner can display him (or her) whether they be old money or poorgeoisie -- this pillow has legs. Somewhere. The Brass Tacks: Enter to win this FREE Thomas Paul pillow, valued at $80, by naming the horsey in the comment box below. That's right -- all you have to do is NAME THIS HORSEY to win a FREE Thomas Paul pillow. You have until Sunday, May 30, at 12 noon CST, to leave your comment below. A random number generator will choose the winner, who will be announced on Memorial Day, Monday the 31st. Sorry, due to shipping constraints, this contest is only open to US and Canadian residents. Please enter only once, but feel free to tell your friends and neighbors, announce this contest on facebook, and tweetaleet all about this bizness. We're looking forward to some excellent names, the best of which will be announced along with the winner, because bragging rights are almost as good as a free pillow right? Right? Now saddle up and get cracking. Yee haw!